Mold and mildew are microorganisms that live on moisture and reproduce by tiny spores moving through the air. People are constantly exposed to molds and mildew. In very small amounts, mold and mildew do not usually pose any health hazard, but when their spores come into contact with moisture, their growth sharply increases. Mold and mildew growing on a surface releases its spores into the air and people can easily inhale them. Once people are in contact with mold’s spores, they could experience health issues such as allergy, asthma, bronchitis, etc. Mold and mildew destroys not only your health, but also your walls, floors, carpets, furniture and thus cause costly damages to your property. Moisture is the food that mold and mildew need to propagate. 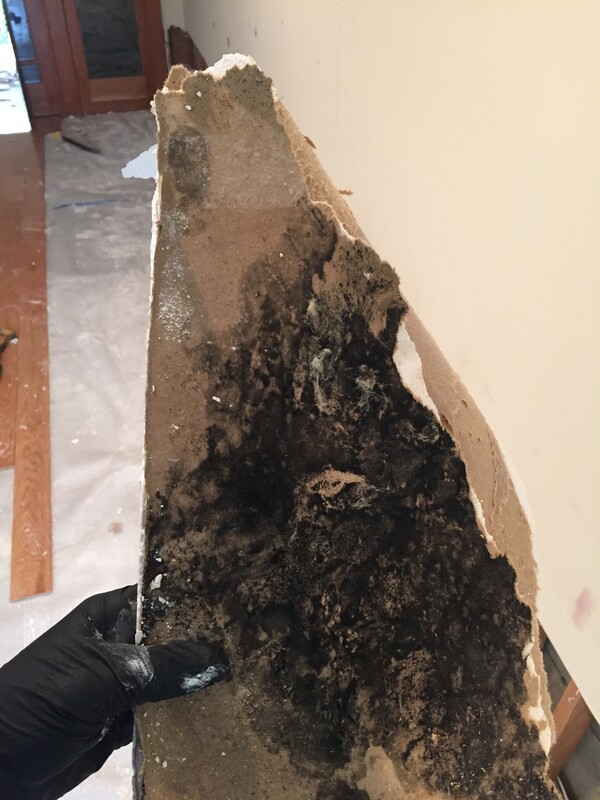 Therefore, damp spaces like laundry rooms, basements, and kitchens are most likely to suffer from molds and serve as a medium for their establishment and growth. Damped confined spaces with poor ventilation. The most common causes of moisture leading to high interior humidity inside buildings are roof leaks, foundation cracks, washing machines and dishwashers’ overflows. Air-conditioning duct joints leaks. Those ones that run through a hot attic, are source of moisture where molds and mildew establish and grow. Waterlight vinyl wall coverings create conditions for condensation trapping moist air. Lack of floor drain in laundry rooms, kitchens, basements, and other damp spaces in homes enables water from overflow to soak into adjacent carpets or other floor coverings and thus creates perfect environment for molds and mildew establishment. Poor ventilation in bathrooms and other damp spaces in homes also promotes mold and mildew to growth. Poor construction of crawlspaces allows mold and mildew to grow by transition of vast amounts of moisture. Freshly cut firewood is a source of great amounts of moisture and when is stored indoors it creates favorable environment for molds and mildew growth. Portable humidifiers and condensation pans placed directly under the coil of central air conditioners can trap moisture and thus serve as medium and distributors of mold and mildew. Concrete basements without proper waterproof from the outside transmit the moisture from the earth to the walls. Yards sloped toward building foundations and thus inviting water to soak basements. Improperly installed windows that allow establishment of large amounts of surface condensation and thus let moisture soak the surrounding wood and insulation. Whether it is a negligible spot on your shower curtain, a mossy white patch on your basement wall or an almost invisible film formed on your kitchen drain, mold and mildew pose serious treats to both, your health and your property. Molds and mildew are health hazardous, especially for people who suffer from bronchitis, asthma or allergies. Whether or not people are sensitive to molds and mildew, mold and mildew exposure can cause eyes, skin, nose, throat and lungs irritation. For those who are allergic mold, mold spores when inhaled or touched may cause allergic reactions, such as sneezing, nose and eyes irritation or skin rash. Reactions to mold spores can be more dramatic in cases of serious mold allergies. These reactions may include shortness of breath or asthma attacks. Mold and mildew pose serious treatment not only to your health but to your walls, floors, furniture, etc. They quickly degrade once subjected to mold spores. Once mold and mildew affected your property, the first step in getting rid of this problem is to detect the source of moisture that allows the spores to grow and spread. The key to mold and mildew removal is to fix the moisture problem that sets the stage for their establishment and growth. It’s not enough to scrub and replace affected materials without fixing the problem with moisture because mold will return soon. Once the moisture problem is fixed, the moldy materials must be disposed of quickly and carefully. Otherwise spores will be stirred up and then their spread in your home will be even faster. Thus mold and mildew will return to your home or business and establish new colonies. Therefore, the intervention of professionals to handle the situation and fix the problem is critical when your property is affected by mold and mildew. Water Damage Repair certified teams of technicians can inspect and assess your property. If mold is found, we have the necessary training, equipment and expertise to remedy the situation. We are a qualified repair and restoration company and have clear understanding that total mold removal from a home or an office is impossible. We do not advertise “total mold removal” because we are aware that this is a fallacy. As a team of professionals who have scientifically knowledge of mold and mold growth we guarantee to remediate the mold and mildew in your property. As log as mold is a part of nature and cannot be totally eliminated, we offer mold remediation focused on getting mold and mildew levels back to natural levels. When you contact our professionals, we will respond immediately because we know that fast remedy lessens the damage, prevents secondary damage and reduces cost. Do not use wall coverings that trap moisture on exterior walls. A floor drain near the dishwasher and the washing machine should be provided. A cement backer board in basements will prevent moisture seepage. A bathroom fan or opened windows are easy and cheap means to exhaust moisture. The humidifier reservoir must be kept clean. Properly install windows to allow good ventilation and thus minimize condensation. Proper home maintenance can prevent mold and mildew. In case of mold and mildew damage our teams of licensed professionals guarantee quick and most important - effective mold remedy. We possess the needed experience, expertise and equipment to handle your problem.